Friends of West Jesmond website and blog: Get your Christmas shopping done in one lovely evening! Get your Christmas shopping done in one lovely evening! Yes, it’s only a few weeks until Christmas, but worry not, you can do your shopping at our ever-popular Christmas Shopping Evening on Wednesday 26 November! Ticket forms can be downloaded HERE. Your child(ren) will hopefully have brought home a beautiful Christmas card design and order form recently. If you would like to order any Christmas cards in your child’s design (and, BTW, the mugs make lovely presents too! 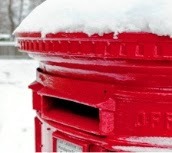 ), please return your completed order form and cheque (made payable to Friends of West Jesmond Primary School) in a sealed envelope marked “Christmas cards” to your class teacher no later than Thursday 13 November. If you have something you would like to sell and you think fellow-parents might be your target buyers, you can now advertise it at school. We now have our very own 'Glue Tree' advertising board. It's located (in a lovely tomato red, so you can't miss it!) on the noticeboard by the covered play area and will operate in much the same way as putting a card in a shop window. and hand to your class teacher or directly to the office. we ask for a donation of £5 per advert (cheques payable to 'The Friends of West Jesmond Primary School' or cash). The advert will be on display for a period of two weeks. Disclaimer: All advertising on the Glue Tree is solely between the seller and purchaser and goods sold/purchased must be arranged off the school premises.